With an area of 36,692 hectares, or 142 square miles (368 km2), and only 188 inhabitants recorded in the 2001 census, Jura is much less densely populated than neighbouring Islay and is one of the least densely populated islands of Scotland. The main settlement is the village of Craighouse on the east coast. 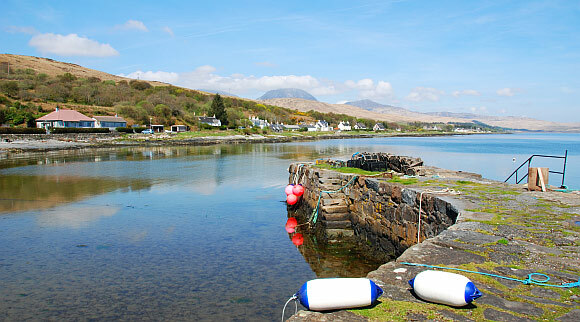 Craighouse is home to the island's sole distillery, producing Isle of Jura whisky. The village is also home to the island's only hotel, shop and church. The chief link to Jura is from the neighbouring island of Islay: a small car ferry operates across the Sound of Islay between Port Askaig on Islay and Feolin Ferry on Jura. In the summer there is also a passenger service between Craighouse and Tayvallich on the mainland. From Feolin Ferry a single track road follows the southern and eastern coastline of the island. To the north ofCraighouse the road leads to Lagg, Tarbert, Ardlussa and beyond. A private track runs from the road end to the far north of the island. The west coast of Jura has no permanent inhabitants, but is home to a number of raised beaches. Between the northern tip of Jura and the island of Scarba lies the Gulf of Corryvreckanwhere a whirlpool makes passage dangerous at certain states of the tide. The southern part of the island, from Loch Tarbert southwards, is one of 40 National Scenic Areas in Scotland. Jura now comprises six estates which are all in separate ownership: Ardfin, Inver, Jura Forest, Ruantallain, Tarbert, and Ardlussa. The Ardfin estate is situated at the southern tip of the island, between Feolin and Craighouse. It includes the 16-bedroom C-listed Jura House, whose famous and beautiful walled gardens benefit from a southerly aspect and the effects of the Gulf Stream. The gardens are home to exotic specimen plants from Australasia. These were, for some years, a popular tourist attraction on the island though they have been closed since a new owner acquired the estate in 2010. The estate also includes 16 kilometres (10 mi) miles of coastline and seven islands over a total of 4,692.3 hectares (11,595 acres).. In November 2010 the Ardfin Estate was bought by Greg Coffey, an Australian hedge-fund manager. He instructed that the gardens should be closed to the public, and ordered the disposal of all livestock from the estate farm. The closure of the gardens initially caused some concern among residents, although Mr Coffey's spokesman indicated that in due course they would be re-opened, probably in 2012 . However, more recent information (February 2012) suggests that the closure may become permanent . The island has a large population of red deer and it is commonly believed that the name Jura is derived from hjǫrtr, the Old Norse word for deer. (In Old Norse dýr was a euphemism forhjǫrtr, as this was a sacred and tabooed word.) Much of the island is used for deer stalking, and visits by stalking parties have become a significant source of employment and a contributor to the island's economy. Through browsing, the deer prevent the vegetation on the island from turning back to woodland, which is the natural climax community; indeed an alternative explanation of the island's name is that it derives from 'the great quantity of yew trees which grew in the island' before the clearances. Two of the Paps of Jura taken from above Caol Ìla on Islay. Beinn an Òir (Gaelic: mountain of gold) is the highest peak, standing at 2,575 feet (785 m), and is thereby a Corbett. Beinn Shiantaidh (Gaelic: holy mountain) stands at 2,477 feet (755 m) high. Beinn a' Chaolais (Gaelic: mountain of the kyle) is the lowest of the Paps, reaching 2,408 feet (734 m). The Paps dominate the landscape in the region and can be seen from the Mull of Kintyre and, on a clear day, Skye and Northern Ireland. The route of the annual Isle of Jura Fell Race includes all three Paps and four other hills. These hills were the subject of William McTaggart's 1902 masterpiece The Paps of Jura, now displayed in the Kelvingrove Art Gallery and Museum. Like all inhabited Hebridean islands, Jura has its own indigenous tradition of Gaelic song and poetry. Towards the north end of Jura, some miles beyond the end of the metalled road, is Barnhill, a remote house where the novelist George Orwellspent much of the last three years of his life. Orwell was known to the residents of Jura by his real name, Eric Blair. It was at Barnhill that Orwell finished Nineteen Eighty-Four, during 1947–1948 while critically ill with tuberculosis. He sent the final typescript to his publishers,Secker and Warburg, on 4 December 1948, who published the book on 8 June 1949. Apart from the connection with Orwell, Jura is also known for an event which took place on 23 August 1994, when Bill Drummond and Jimmy Cauty, known then as the music group The KLF, filmed themselves burning £1 million in banknotes in the Ardfin boathouse on the south coast of the island. Gaelic has suffered a major decline over the last 200 years. The 1881 census reported that 86.6% (out of 946 inhabitants) spoke Gaelic. In 1961, for the first time less than half (46.9%) spoke the language and by 2001, this figure had dropped to 10.6%. Jura is featured in the plot of the 2003 novel A Question of Blood by Ian Rankin, the 2007 novel The Careful Use of Compliments by the Scottish writer Alexander McCall Smith and is a setting for some of the narrative and action in Anne Michaels' 2008 novel The Winter Vault. Jura is mentioned in: "Crossing to Jura", a song by R. Kennedy and D. MacDonald, recorded in 1997 by JCB with Jerry Holland on the album "A Trip to Cape Breton"; "The Bens of Jura", a song by Capercaillie; and "Isle of Jura", a song by Skyclad. The 2010 album 'Poets and Lighthouses' by Tuvan singer Albert Kuvezin of the band Yat Kha was recorded and produced by the British musician Giles Perring on Jura, with some of the performances being recorded in the forest at Lagg. The album reached Number 1 in the European World Music Charts in Jan 2011.